New Delhi, India – Neelam Devi, a landless agricultural labourer, travelled more than 1,000km this weekend to India’s capital with a mission. 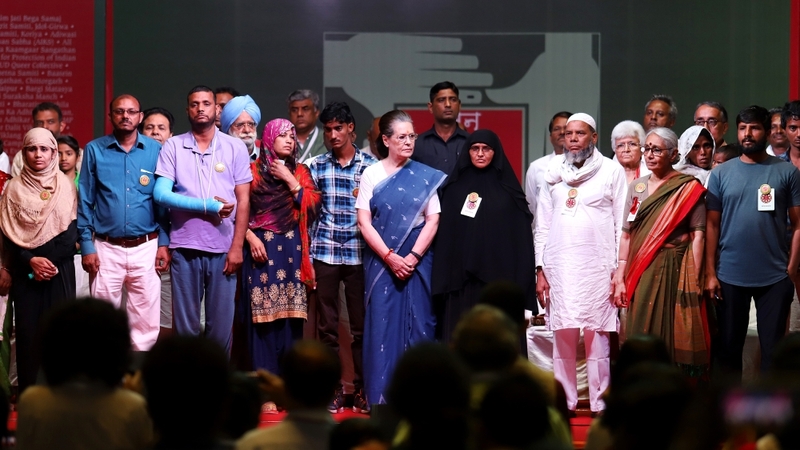 Along with some 4,000 of the country’s most vulnerable and marginalised people, she attended a day-long “People’s Agenda” meeting at New Delhi’s Talkotra Stadium on Saturday, just days before the world’s largest democracy goes to polls on April 11. 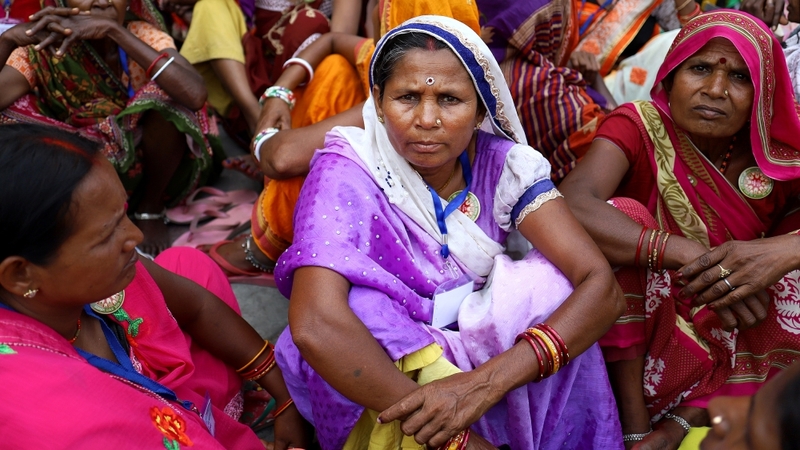 For Devi, the loss of workdays due to the long journey from the eastern state of Bihar only exacerbated her woes – but she was determined to express her frustration at the government of Prime Minister Narendra Modi for its failure to provide her work under a rural employment guarantee scheme. “Why am I not being given 100 days of employment as promised by the government under MNREGA [Mahatma Gandhi National Rural Employment Guarantee Scheme]? How will I feed my children,” she told Al Jazeera, shielding her face from the sun. Launched in 2006 by the Congress party-led government and inspired by Keynesian macro-economic theories, MNREGA was an ambitious job guarantee scheme that is aimed at unskilled workers. Modi, who mocked the MNREGA throughout his campaign in 2014, retained the scheme after winning the polls but its implementation was crippled by budget constraints. The dilution of the employment guarantee scheme was one among a slew of complaints presented by the demonstrators in a 40-page “chargesheet” against the right-wing Bharatiya Janata Party (BJP) government of Modi, who is seeking a second term in the upcoming elections. The document included the targeted killing of Muslims and Dalits by Hindu far-right groups, rising unemployment (“the worst in 45 years”), dilution of laws to allow takeover of tribal and forest lands by corporates, over “75 hunger deaths” since 2015, less spending by the government on social welfare schemes, and attacks on freedom of expression. The demonstration, which was held barely two kilometres from India’s parliament, was jointly organised by more than 300 civil society groups and people’s movements from all over India. Also in attendance were the leaders of a cross-section of Indian opposition parties. “People’s movements fall silent at the time of an election. We are saying the civil society will no more be silent,” Nikhil Dey, an activist and one of the organisers of the meeting, told Al Jazeera. Dey said the goal was to highlight the real issues which “always fall victim to the divisive politics played during elections”. As various political leaders belonging to the Congress, the Left parties, the Aam Aadmi Party and the Dravida Munnetra Kazhagam (DMK) spoke, a group of organisers ran criss-cross through the crowd with a large cloth banner that read “Save the Constitution”. The demonstrators from across the country had a personal story that was reflected on the “chargesheet’ drafted by the activists. Among them were a dozen “silicon widows” from the western state of Rajasthan. Their husbands had suffered premature and painful deaths due to silicosis, which they got from working in the silicon mines of Rajsamand district. “The job letters [to their husbands] were actually death warrants,” activist Shankar Singh, who works with Rajsamand’s silicon miners, told Al Jazeera. There was also Fatima Nafees, the mother of Najeeb Ahmed. Ahmed, a biotechnology student at New Delhi’s prestigious Jawaharlal Nehru University (JNU), mysteriously disappeared more than two years ago following an alleged scuffle with members of Akhil Bharatiya Vidyarthi Parishad (ABVP), a student group affiliated to the Rashtriya Swayamsevak Sangh (RSS), the ideological mentor of the BJP. In October last year, India’s Central Bureau of Investigation (CBI) ended its search by telling the court there was no evidence of a foul play – a closure report dismissed by Ahmed’s desperate mother as a “conspiracy” by the government. Sooraj, 23, who is from the Dalit community – people at the lowest end of the Hindu caste hierarchy – is a survivor of an “honour killing” in the BJP-controlled western state of Haryana. He attended the meeting in the hope of justice for his mother, father and brother. They were shot dead after his brother married a woman from a higher caste. The killers were from the bride’s family. Other speakers at the “People’s Agenda” meeting included Saira from Haryana’s Ballabhgarh. Her 16-year-old son, Junaid, was stabbed to death inside a crowded train just because he was Muslim. He was returning home from shopping for Eid-ul-Adha in New Delhi. Also present was the family of Sajid Akhtar, 40. He was brutally beaten and his house in Gurugram, on the outskirts of New Delhi, was ransacked by a mob last month on the day of the Hindu festival of Holi. The pretext: attackers said a cricket ball had hit them. “They were constantly shouting: what are you doing here, mullah? Go to Pakistan and play,” Mohammad Akhtar, Sajid’s brother, told Al Jazeera, calling it a “well-organised attack”. Also attending the event wsa Shama Parween, whose husband, Zahid, was lynched in the northeastern state of Tripura last year over a rumour that he was a child trafficker. Speaking to Al Jazeera at the sidelines of the event, author and activist Arundhati Roy said she saw a linkage “between the agenda of hatred, the breaking down of economy and the corporatisation of media”. “The RSS believes the constitution of India is a foreign document. It believes that India should be declared a Hindu nation. It finally got its people in power and shown us in the last five years what it is capable of,” she said. Sonia Gandhi, the former president of the main opposition Congress party, said “the spirit of India was being trampled upon as part of a well-planned conspiracy”. “Today, we are being taught a new definition of patriotism as people who reject India’s diversity are being hailed as the real patriots,” she said in her address, asking the audience to defeat the BJP in the elections. Explainer: Who are Kashmir’s armed groups?